The Event Group will create a customized package based on your needs. Please contact us to set up a consultation. Troy Polamalu is a safety for the Pittsburgh Steelers and is highly recognized by all NFL fans for his on-field talent, off-field community involvement and hair. In Steelers’ Nation, he’s a fan favorite. Troy and his team approached The Event Group for an fundraiser that encompassed his American Samoan heritage and two beneficiaries that he’s very passionate about – The American Samoan Football Camp and military veterans. 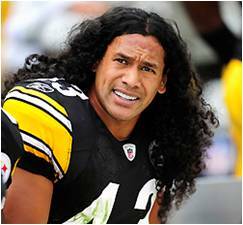 To create a concept that includes a tropical luau event with Pittsburgh Steeler Troy Polamalu. Incorporated tropical elements and colors and the identifiable visual of Troy Polamalu’s jersey number (#43) and the Steelers’ black and gold color scheme. The logo also included a football pigskin texture in the football/oval shape. The letterhead also included both elements on both sides.